The thought of a newly-minted-18-year-old armed with a credit card and no idea how to use it is enough to make any parent lose sleep. 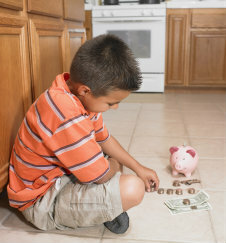 A Youth Savings account from Blue Ridge Bank not only allows your child to set aside money, it also builds a foundation for smart money management later in life. Don't play Russian roulette with your money. Set your child up for future success today with as little as $10. Just think of the interest earned as a little collateral for all the future IOUs. Bring in your student's report card each grading period and we'll deposit $5 into his/her Youth Savings Account for each report card with an "A". *A parent or legal guardian must jointly be on the account for minors under the age of 18.